I am happy to report that we have ten new volunteers joining our ranks! We had a training event on Friday, Feb 1st and we welcome new volunteers. • Gas cards are available to volunteers who help transport birds to rehab. These were provided through a grant that Deborah and Crosby won for the club. Please take advantage of these as a thank you for helping out the birds! • Don’t forget to SEND ME REPORTS if you have any bird rescue activity (even if you were not able to catch the bird). You can call or text (804) 305-6014 or email me. • Bird rescue equipment is available at the Nature Coast Biological Station in the yard shed between Island Place and NCBS. Please feel free to borrow this equipment any time and let me know if there are any issues. Success story: Cedar Key Bird Rescue members Robin Gillies and Anne Lindgren released a rehabilitated pelican at the Cedar Key Marina on 8/14/2017. This pelican was originally rescued by Crosby Hunt and Deborah Anderson and was rehabilitated by Mary Opall and team at Nature World Wildlife Rescue center. It tipped its wings in appreciation once it hit the water. If anyone has rescue reports to submit - please send them in! Even if the rescue was "unsuccessful" (e.g., if you went looking for a bird but could not find it or could not catch it) we need to keep track. A text, email , or phone call (804-305-6014) to me with the info about the rescue would suffice if the paper form is too much of a burden. I need the species, type of injury, volunteers that helped, approximate amount of time spent (including transport to rehab, if any), and outcome of rescue (if known). The folks listed on the phone tree link are volunteers. 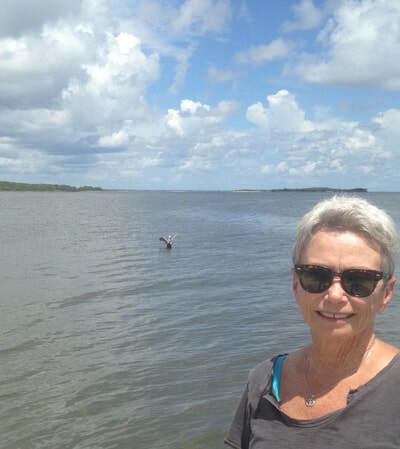 Success Story - On Friday May 26th, 2017, Cedar Keys Audubon Co-President Crosby Hunt and a friend picked up a pelican and an osprey from Nature World Wildlife Rescue Center and returned them to Cedar Key. 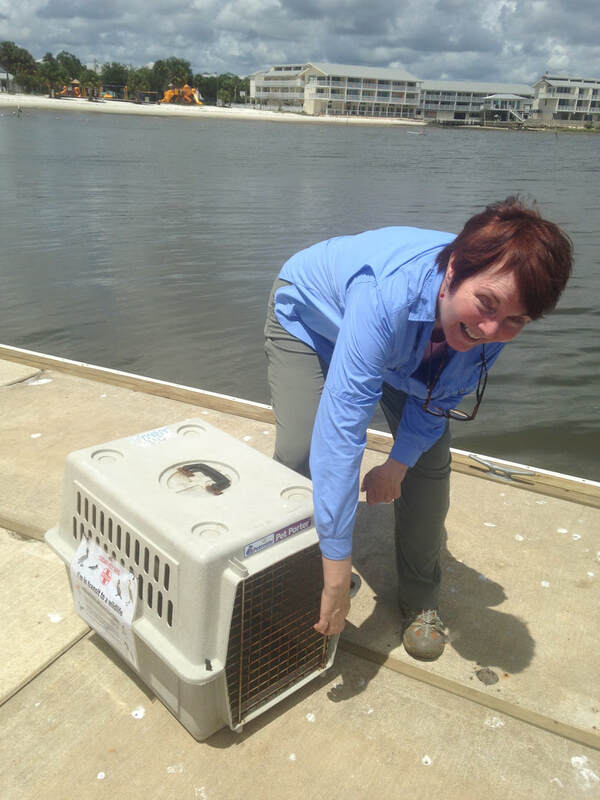 He released the pelican at the number 4 bridge fishing pier. Captain Doug Maple joined them at the city marina with his boat and the three of them transported the osprey to Atsena Otie for release. This osprey was rescued during the spring Arts Festival in April 2017. The bird flew about 150 yards over water and then dropped into some mangroves happy to be back home. 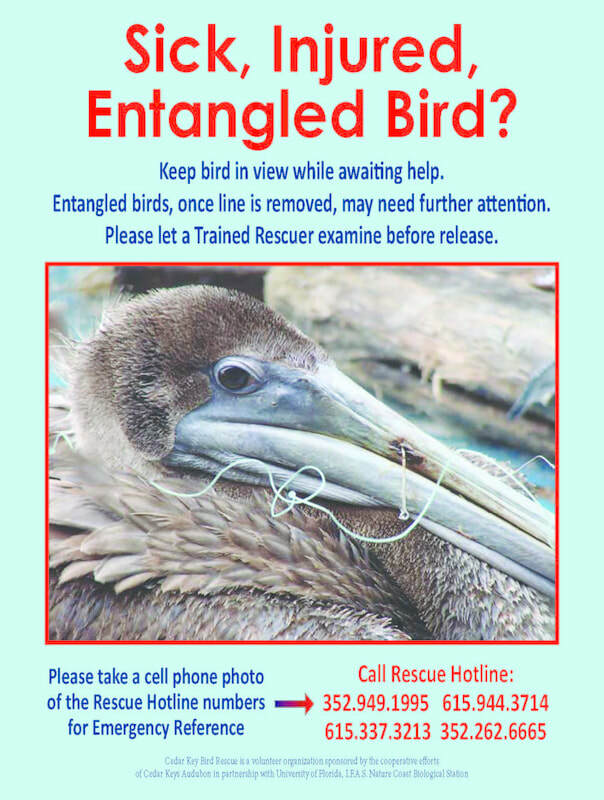 Cedar Key Bird Rescue --for 2017 as of 22 May - 49 total injured bird reports since Christmas, 35 were entanglements or throat obstructions. There were 25 attempted rescues where the bird could not be caught or located. Of the 24 rescues where the bird was caught or located, 11 rescues resulted in a successful release, 7 of them resulted in humane euthanasia or death in transit to rehab, 4 birds were kept under observation and recovered on their own, and 2 cases still pending outcome report. Total hours in 2017 = 128.5. 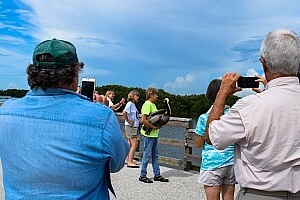 Regional Sea Grant Extension Agent Savanna Barry worked in cooperation with the newly minted Cedar Keys Audubon chapter, the Cedar Key City Commission, FWC staff, and Nature World Wildlife Rehabilitation Center to address this need through a new program. 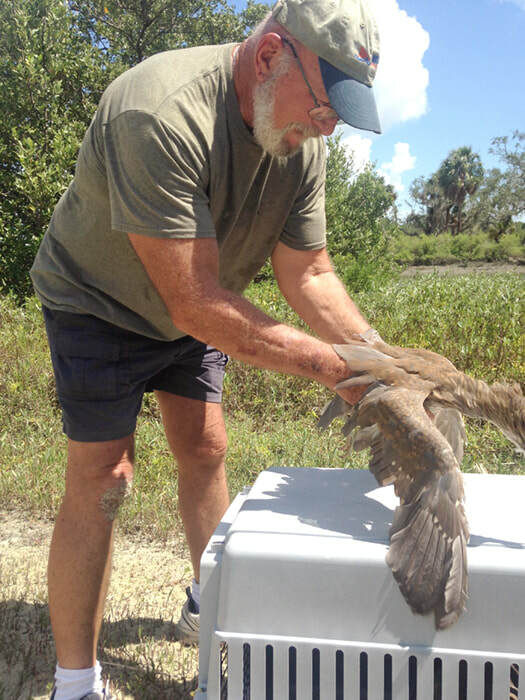 A training held workshop on July 22nd, 2016 marked the official launch date of the Cedar Key Bird Rescue initiative. A group of 21 people were trained in safe bird handling and de-hooking techniques, bird transport protocol, and incident report data collection. Licensed wildlife rehabilitator Mary Opall of Nature World Wildlife Rescue in Homosassa, FL brought a live pelican and demonstrated proper handling techniques. 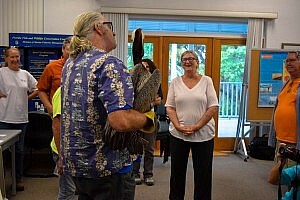 Workshop attendees were able to practice bird handling skills with Mary’s guidance and reported a 60% average increase in their confidence to properly handle and rescue birds. At the end of the workshop, volunteers participated in the release of the live pelican, which had been rehabilitated by Mary and her staff. In total, 13 trained volunteers joined a phone tree that will be activated when an injured bird is reported, and will respond to calls as needed. “[This is] such a great collaboration” wrote one volunteer, while another stated “regarding the Bird Rescue Initiative, great ideas and long overdue”.